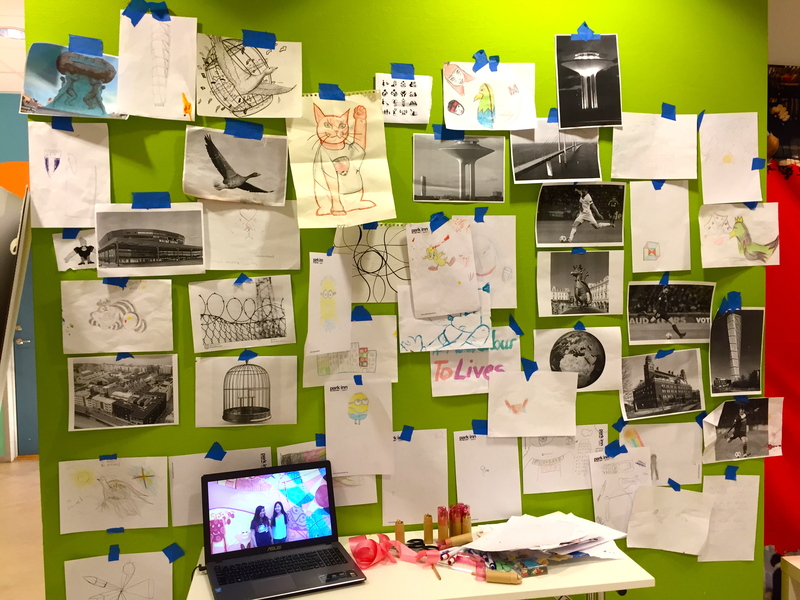 In August of 2015, I visited Malmö, Sweden for the first of a series of community-based public art projects in five different countries for the #AddColourToLives initiative, which features partnerships between grass-roots youth organizations and local Park Inn hotels. The idea is to give hotel employees, from cooks to room cleaners to managers, the opportunity to get involved in their community by forming long-term relationships with youth in difficult life situations, including recently-arrived refugees, teens from marginalized communities and kids who have been taken from their families. To kick off this initiative, I was invited to organize collaborative community mural projects that would explore issues important to the youth and focus on building positive relations between the participants. 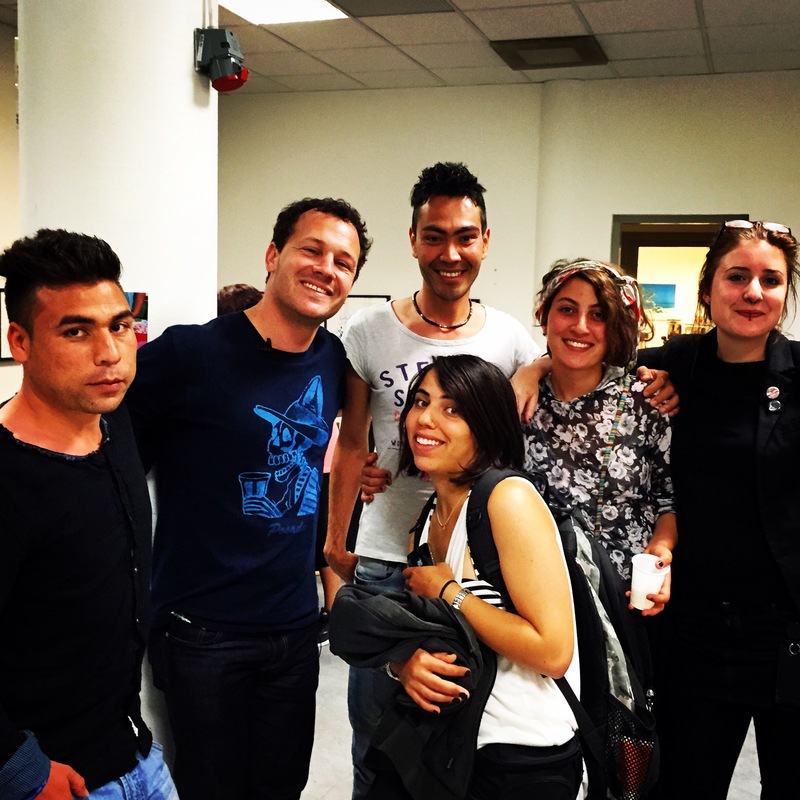 In Malmö, our partner was Fryshuset, an incredible center that has programs that focus on addressing issues facing the youth: violence, gangs, extremism, unemployment, social exclusion, gender-based discrimination, and more. 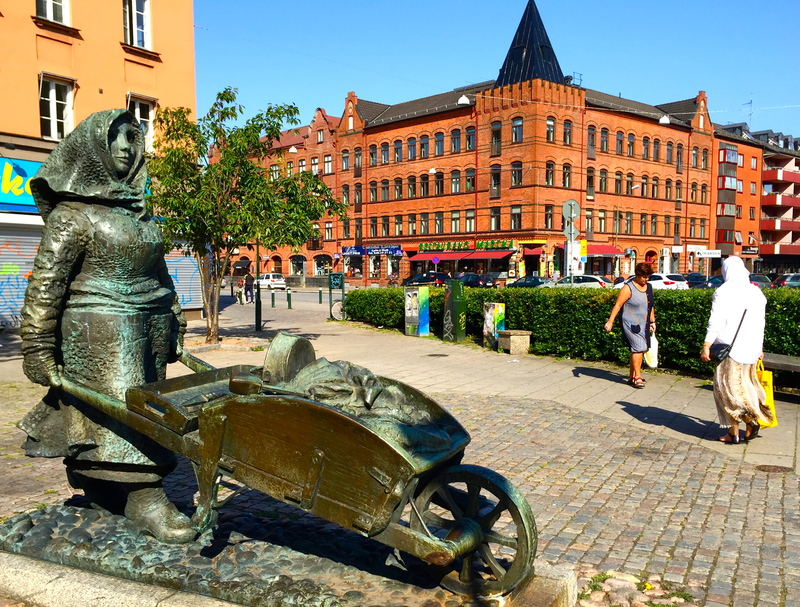 Upon arriving in Malmö, I expected to see plenty of stereotypical Swedes; you know– tall, blonde, blue- eyed… So you can imagine my surprise when I instead encountered Arabs, Africans and Central Asians. Had I come to the right country? It turns out that Malmö is one of the most diverse cities in Europe thanks to Sweden’s welcoming policies towards refugees and immigrants, with 40% of the population foreign-born. In fact, not one of my youth participants at Fryshuset was of Swedish origin. It was fascinating to meet them and discuss their lives growing up in such a different culture from the ones they came from, which included Iraq, Bosnia, Afghanistan, Palestine, Brazil, Cameroon, Romania, China and more. In our introductory workshop we played games to loosen up and I facilitated arts-based activities. We discussed the issues that they wanted to address in their mural, which was to be painted on the walls of their youth center. Together, we explored topics such as confronting racism, cultivating a welcoming environment for those fleeing hardship, and creating a safe space for those of diverse backgrounds, ideologies and sexual orientations. This last topic in particular caused a bit of controversy, as the young people ranged in their attitudes toward homosexuality, with some passionate about gay rights and others openly uncomfortable with the subject, to the extent that a few threatened not to participate. But in the end they all agreed to join in, and I felt that a small battle for inclusion had been won. 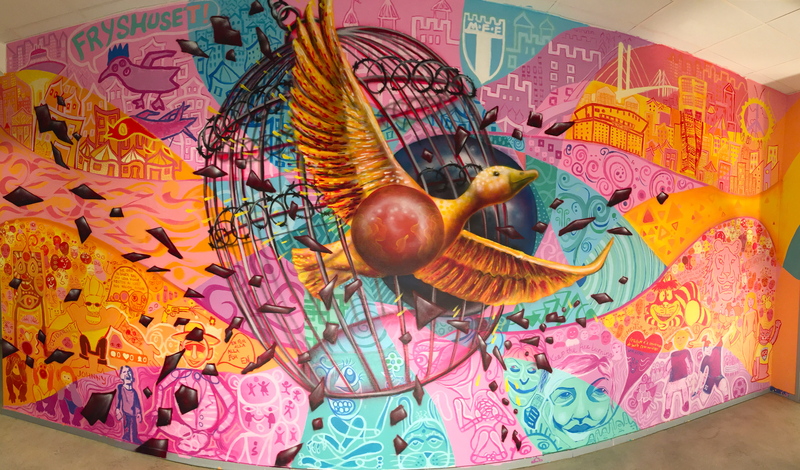 The central image of the mural was a bird breaking free from a cage, which the young people felt expressed their desire for freedom and a breakdown of traditional boundaries and borders, both physical and mental. 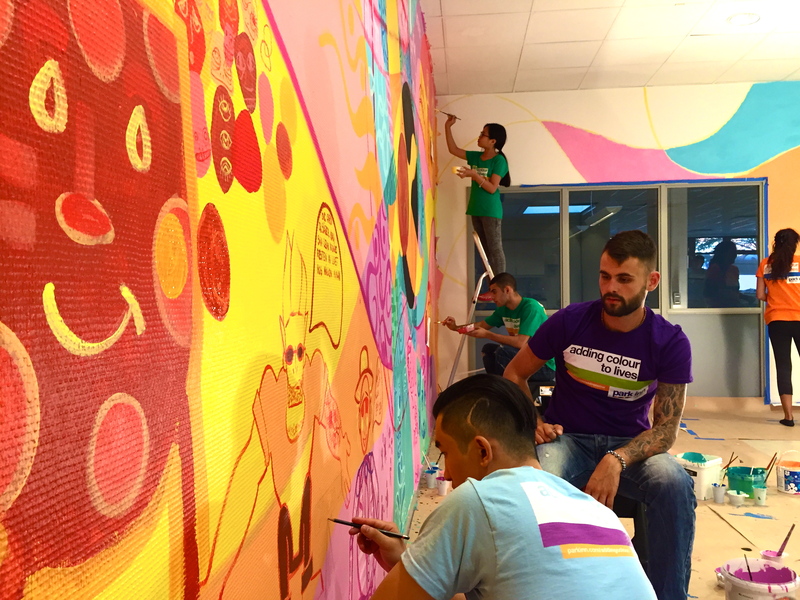 The rest of the mural was made up of the reflections of the participants on this subject, as well as imagery that they felt represented them and their communities. Once we started painting, the teens were highly opinionated about what images would go on the wall, which I was happy to see because it meant they cared about their mural. However, I was surprised by the lack of self-confidence they had in their abilities, and many refused to paint at first! “This is what I want painted in my section; can you do it for me? If I paint it will look ugly,” they would plead. Slowly, the team and I guided the participants in the process of letting go of inhibitions and having fun with art making. In the end, many expressed shock at what they had achieved. Most importantly to me, positive connections were made between many of the teens, adults, hotel workers and their families. It was incredible to see people of such diverse backgrounds all working together on a common goal and supporting one another. I also enjoyed speaking to the young people about their experiences. I asked one about whether political and ethnic divisions from their home countries affected them. He responded by pointing to another boy painting on the wall. “I am Kurdish, so I hate Saddam Hussein,” he told me, in reference to the former leader of Iraq who famously gassed thousands of Kurds to death.